There's a birthday this weekend, and birthdays always mean baking. Last year, after a sprinkle explosion, there were donuts; this year, I was asked to replicate this, then not so subtly told about a new found love for red velvet cake. I knew there had to be a happy in-between. (If I'm being an extra fabulous girl friend, I'll make him this next week). I've made ice cream sandwiches before, and seem to always forget about the amount of time and patience they demand. So be forewarned, this recipe isn't a quick one, but its festive, celebratory and delicious! The cookies were soft right out of the oven, but hardened as they cooled, yielding a perfectly crunchy, chocolate laced cookie, totally ready to accept a slab of creamy vanilla ice cream. So good! In a small bowl, whisk together the flour, cocoa and baking soda. Set aside. In the bowl of a stand mixer fitted with the paddle attachment, beat the butter and sugar on medium speed until combined. Continue to add the egg yolk and mix to incorporate. Finally, add the food colouring and vanilla and mix until the colour is evenly distributed. Scrape down the sides if need be. Reduce the mixer speed to low and gently add the flour mixture; beat just until the dough comes together. If the dough doesn't stick together when pinched, add a dab of water and incorporate with your hands. Use your hands to split the dough into two 1" disks, wrap tightly in plastic wrap and refrigerate for 2 hours. Preheat oven to 350 and line 2 baking trays with parchment paper. Lay a piece of parchment on the counter and dust lightly with flour. Remove one disk of dough from the fridge and transfer to the parchment. Cover the dough with the leftover saran wrap and use a rolling pin to roll the dough to a 1/8" thickness. Remove the plastic and use a cookie cutter to cut the dough (round or square, ~2 1/2", is ideal). Transfer to the prepared baking sheet. Put the scraps back in the fridge, remove the other disk, and repeat. Continue until you've used up all the dough and made an even number of cookies. Bake the cookies for 8-10 minutes, rotating the tray halfway through. Let the cookies cool for 3 minutes on the tray, then transfer to a wire rack. While the cookies are baking, prepare the ice cream. Line another baking tray with parchment paper. Place the cookie cutter on the tray and stuff with ice cream, about 1" thick. Use your hands to press down and smooth out the top. Repeat for as many times as required for the number of cookies you made. Transfer to freezer and let rest over night. 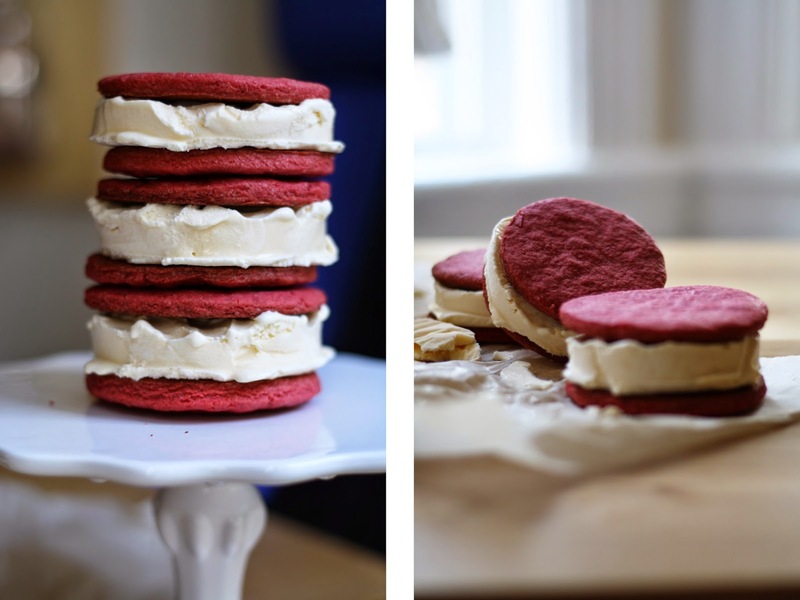 The following day, make your sammies by placing an ice cream 'patty' between two cookies. Enjoy immediately, or store in the freezer, individually wrapped in saran, or together in a tupperware.